The Albany Woolly Bush ( Adenanthos sericeus ) is an attractive Australian native shrub with soft green silvery foliage and red flowers in spring. The species will reach around 3m in height if not pruned, taller in some conditions, however Adenanthos do take to being pruned. Also known as ‘Silver Streak’. Dwarf forms are available and in the right position they are a beautiful plant. They do grow naturally to a nice shape and are well suited to growing in containers. A sunny position and a well drained soil are essential. Well suited as a feature new the back of the garden border, the thick growth make it a good screening plants. Flowers are attractive, but held beneath the foliage so really not a significant feature. Also suited to use as a low hedge or a general feature plant. 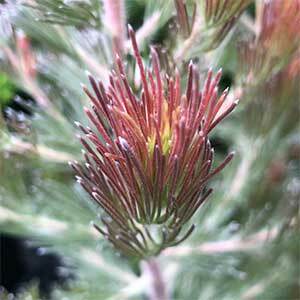 The soft foliage and attractive nature of Adenanthos sericeus make it a useful plant in many areas. Grown simply in a native garden, or in the mixed border it adds texture and a soft look. As a low to medium hedge, with a difference, or grown in a container and shaped by tip pruning. 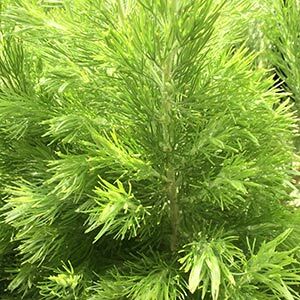 Grow in sun to part shade, water well until established, but ensure that drainage is good as Adenanthos do not like damp conditions, however it does not like long dry summers either. Fertilize using a native plant food. Mulch to provide a cool root run. Reasonably drought tolerant once established, however some extra water during long dry periods will improve performance. A few different thoughts on this, tip pruning can be carried out to maintain a bushy habit and this is best carried out in spring after flowering. Damaged foliage can be trimmed back at any time. HOWEVER, we have been growing this for a few years, and our friendly canine companion has managed to ‘flatten’ it a few times, we were forced to hard prune to remove the damage, and it has thrived. Soil – Well drained humus rich, sandy loam. Height – Generally 1 -2 metres, sometimes taller. Spread – Upright in habit spreading to 1 metre. We do read a little about these plants ‘ falling over’, and this is because of the root system which seems to be a little ‘shallow’. We solved the problem by planting ours between to rocks, we actually dug the hole, put the ‘woolly bush in, put 3 rocks around the bush ‘in the hole’ and backfilled. Seems to have forced the roots to go a little deeper. To much water and the roots mat well begin to rot, so good drainage is essential. Also make sure you are using a low phosphate fertilizer.